Our 'will you be my bridesmaid?' 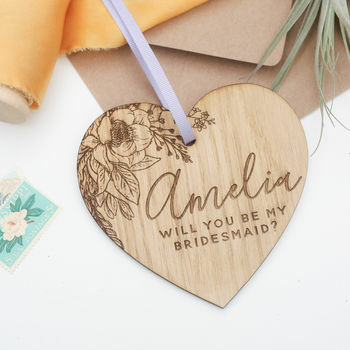 engraved wooden keepsake is the perfect way to pop the question to your bridesmaids. Perfect for a bridesmaid proposal, or why not gift it along with one of our cards as a 'will you be my maid of bridesmaid?' gift? Bridesmaid, page boy and flower girl versions are also available. Personalise with your bridesmaid's name and choice of ribbon to suit the theme of your day. Engraved in our cheshire studio, this wooden keepsake will last for years to come and can be personalised with the name of your bridesmaid. Perfect for adding in to 'will you be my maid of bridesmaid?' boxes. Wording can be changed to bridesmaid, maid of honour or flower girl.